The droneSpace is the MAV flying arena of the Institute of Computer Graphics and Vision. It was setup as part of the User's Flying Organizer (UFO)-Project, starting from 2015. Additional lectures and projects that utilized the droneSpace were the Camera Drones Lecture and the VMAV-Project. The dimensions of the flying arena measure about 6x4x3m (LxWxH), whereas it is tracked by a highly accurate Optitrack Motion Tracking System. A core component of the droneSpace is an autonomous MAV flight system which was developed by W. A. Isop and consists of a MAV prototype design and a complementary ROS control framework. Details about the autonomous MAV flight system, also called the SLIM, can be found HERE. The droneSpace is located in the Inffeldgasse 25 building, as part of the Graz University of Technology Campus, whereas a detailed floorplan is shown HERE! Fig. 1: Latest version of the scaleable MAV prototype as part of the autonomous flight system. Fig. 2: Three different configurations of the prototype including Monocular Vision- and Depth-Sensors. The scaleable MAV design, shown in Fig. 1, builds upon a lightweight frame of the Parrot Bebop 2 and small/soft propellers producing as little turbulences as possible. The design specifically aims for flight in narrow environments and close to humans. It includes the PX4-Pixhawk for low level flight control and various types of sensors and single board computers to provide resources for more computational expensive tasks (Fig. 2). This lecture imparts knowledge about theoretical and practical aspects of setup, functioning, applications and guidelines when using camera drones. The topics addressed include basics about quadrotor control, theoretical knowledge about control and navigation, camera based flight control (visual inertial navigation, obstacle avoidance, path planning and motion capture systems), computer vision combined with 3D-reconstruction, Planning of vision based flight flights with MAVs, legal and practical aspects for drone flights and common robotics frameworks (ROS). 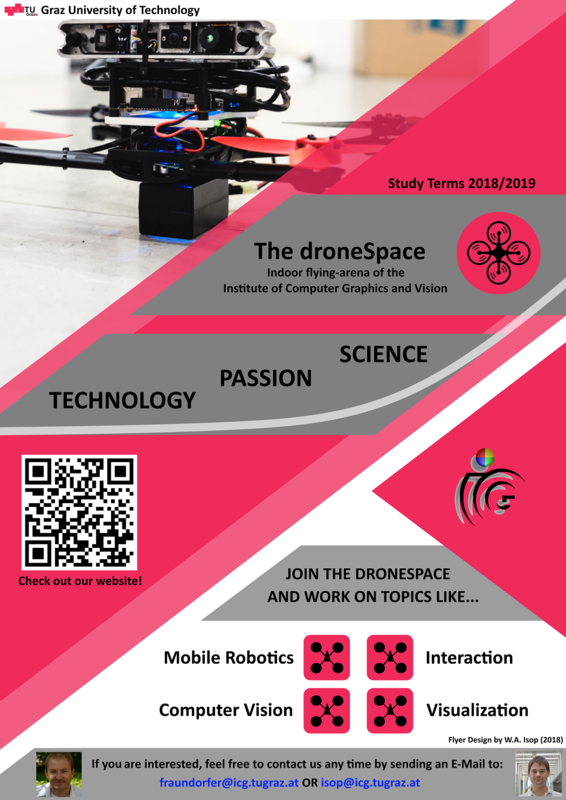 The lecture consists of a practical part, in which students can gain knowledge about topics like interfacing a quadrotor with ROS, object detection, mapping and navigation. For this purpose students are using the autonomous MAV flight system, which is based on the Parrot Bebop 2. 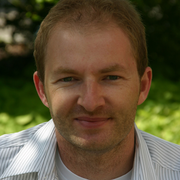 The framework is used to implement and test tasks, given to the students as part of the lecture. 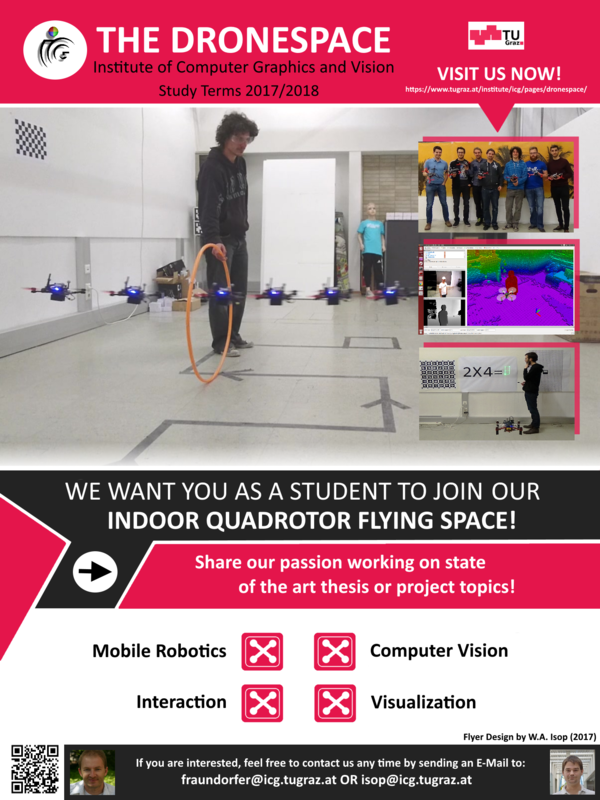 In the final phase, students can then test their implementation during flights in the ICG's indoor MAV flying arena, the "droneSpace". Since Winter Term 2017/2018, the practical part consists of an MAV rescue challenge. Participating students have to work on different task categories to find an artificial victim, which is placed inside the flying space. The practical part is complemented with a written exam at the end of the semester. The course homepage can be found here. Don't forget to check out our new videos from the last winter semester which you can find here as playlist or below! Group 1 has to first let the MAV autonomously explore the close environment and then let a remote user decide where to explore next to finally find a potential victim. Compared to the other groups, Group 1 uses a PRM-planner to generate global path points for exploration. With Group 2 we seperated the challenge into two iterations. For the first iteration occupancy information is given and a remote user defines a goal close to where a victim is expected. For the second iteration Group 2 updates occupancy information online from the created Octomap and, based on that, generates navigation paths to explore the environment. Following the principle of a scavenger hunt, Group 3 has to detect QR Codes, use the encoded information to navigate inside the environment and finally find the victim. When throwing a reflective marker towards the drone (parabolic trajectory), the drone should avoid it if a hit is imminent. 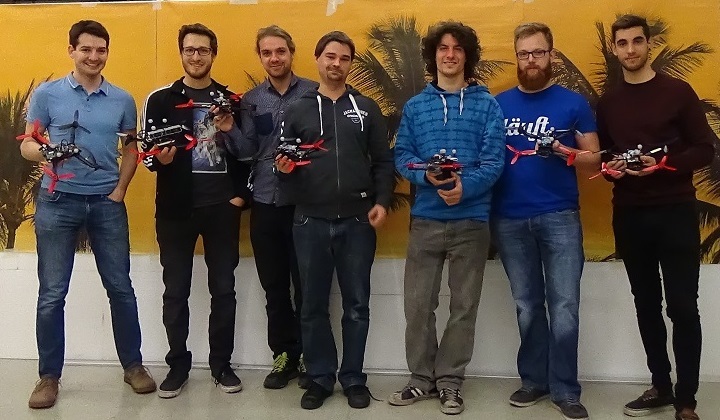 Pose measurements of Optitrack and RGBD-sensor data from the flying drone are used to map the indoor flying space. Based on the depth data, an Octomap 3D occupancy grid for visualization is generated onboard. 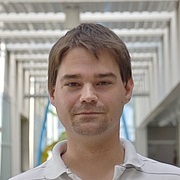 A monocular vision sensor is used to recognize basic hand gesture inputs to give commands to a micro aerial vehicle. The onboard monocular vision camera is used to track and follow a visual AR marker in 4DOF. The onboard monocular RGB camera of the drone is used to recognize a target (hula-hoop) and estimate its position. After targeting, the drone then should be able to pass through it. The ORB2 SLAM framework should be tested for use with onboard sensors of the drone to localize itself and create an Octomap based 3D occupancy grid for visualization. The second onbaord XU4 single board computer of the drone platform should be complemented or even replaced by the more compact Snapdragon Flight board which includes a vision camera already. Further, based on the images of this camera, the drone should autonomously detect visual objects (patterns) during flight and follow a path depending on them. 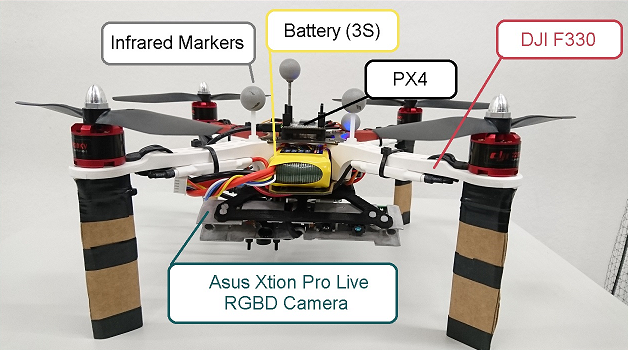 "3D-Object Reconstruction Using A Camera Drone With RGBD-Sensor"
Based on the F330 MAV platform of the Micro Aerial Projector a RGBD-Sensor equipped reconstruction drone was designed to semi-autonomously reconstruct 3D objects. 29.03.2018 - Our new Flyer has been released! Also checkout our new videos from the last terms lecture, which you can find here! 08.03.2017 - Our new Flyer has been released!